Setting: Pytharia, DCU, 140th-century B.C. 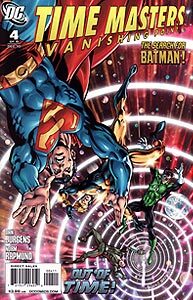 Cover Description: Superman, Booster Gold, Green Lantern, and Rip Hunter fall into a vortex. Brief Synopsis: The Time Masters fight to free themselves from certain death. Issue Notes: According to the cover, this issue (as well as the entire mini-series) is a "Search for Bruce Wayne" tie-in, despite only 4 interior panels mentioning it. Booster Gold is trapped in a dark cell with Green Lantern. Despite being forced into such tight quarters, the two still can not get along. 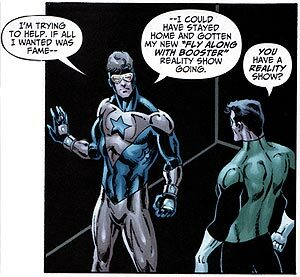 Booster teases that he has his own reality television show, Fly Along With Booster. Though Booster is insincere, he would no doubt have many, many viewers. Liri Lee confirms Waverider's death in the pages of 52. Despite lasting only 4 pages, it seems that the Time Stealers' presence at the end of time is the real story of this issue, and perhaps the entire mini-series. Booster communicates with Skeets and Rip Hunter via communicator. Like Booster, they are in death-trap situations. Boosterrific Review: Why isn't this a 4-issue mini-series? Why is this story a mini-series at all rather than a story-arc in Booster Gold? Nothing has significantly advanced the story in 3 issues. I'm not saying that there aren't things to enjoy in this latest issue (namely the future Booster introduction and Booster/Green Lantern banter), but I will certainly say that there is very little here outside of an affection for the art of Dan Jurgens or Booster Gold (or Skeets!) that would justify the $3.99 cover price. I'm with Erin. I enjoyed the issue and put it's context out of my head. The Hunter family is still fun and I like Booster saving the day (sort of). Basically, this series flushes out Rip Hunter and establish the next big arc. Fully in agreement with our gracious host. There are some fun moments but this is getting stale. I will say the Black Beetle caught my attention this issue. I really enjoyed this issue. I stopped caring about the tie ins a few issues ago and just liked the story. 'Nuff said above. On another topic: A show called "Fly Along With Booster"?? Sounds like a kiddie show, with lots of advertisements for Booster costumes, Michelle tea sets, and Skeets plushies. Parents in the DCU should definitely guide their kids when watching this.